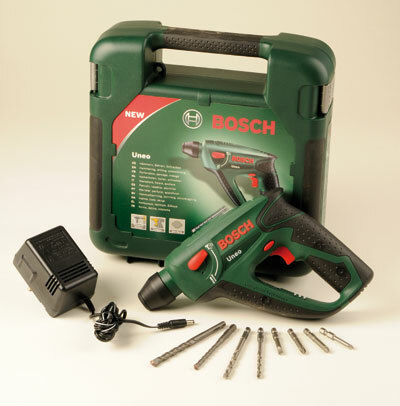 It's almost becoming a cliche - Bosch have a fine knack for quietly sending us low-price, high quality Lithium Ion power tools. Sometimes, they're a little niche to appeal to every reader, but often they'll actually be pretty much applicable to the majority of home workshops. The Uneo very definitely falls into the latter of these two categories: Bosch are incredibly proud of it, and it's fair to say that this is not without reason. In the hand to begin with, I have to say it felt quite 'end heavy', tilted to the chuck. One handed, it might need a little bit of unnatural-to-begin-with compensation from your hand. However, if you look at the handle around the trigger, you'll see the grippy rubber extends around to the front of the almost-trapezoid. You're using one hand to control, the other to comfortably balance, It works incredibly, well, even and especially when you need to put some weight behind the Uneo to tackle masonry. The charging port is hidden in the handle, and having no battery to snap in and out means that the package as a whole is convenient to use. Whether you're using the hammer or drill settings, there are bits that will suit your situation nicely. On that note, The chuck does an excellent job of locking in the bits. Not too costly, and a tool that goes over and above the expected remit of being 'quite handy'. 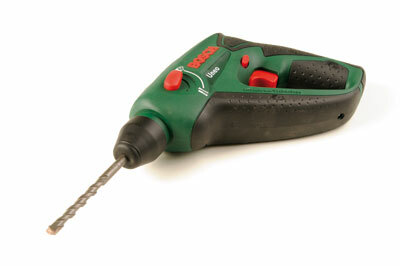 This might well end up being one of the most oft-used tools in a hobbyist workshop, especially for those on a budget. "This might well end up being one of the most oft-used tools in a hobbyist workshop"